"I miss you already. You were the best mother-in-law. Until..."
"Fly with the Angels Moma. We will be fine here on mortal..."
Ruedell Bishop Crawford passed away peacefully at home on Wednesday, September 12, at the age of 87. She will be sorely missed by her family and friends, especially the church members she considered her ""other"" family. She was a native of Commanche County, Oklahoma, and a resident of Baton Rouge. As a member of Francis Asbury United Methodist Church, she served in many ways, but her favorite was teaching children's Sunday school. Ruedell spent much of her time working as a volunteer for a variety of organizations. She was a docent at BREC's Magnolia Mound Plantation for over 20 years and volunteered at Earl K. Long Hospital, Southeast Ministries and the United Methodist HOPE Ministries. 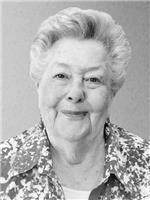 She was also an active and fun member of two Pokeno groups and enjoyed playing dominoes with her church friends. She had a passion for gardening and cooking and excelled at both. She is survived by children Mary Crawford LeBlanc and husband Edward of Hammond, Louisiana; Paul Crawford and wife Johanna of Brusly, Louisiana; Mark Crawford and wife Paula of Baton Rouge; Barbara Crawford of Baton Rouge; and Joseph Crawford of Plaquemine. She was adored by her ten grandchildren, five great-grandchildren and special animal friends ""Bear"" and ""Destinee."" Preceded in death by her parents Roy Bishop and Mary Hillary Bishop; her brothers Lee Bishop, Orville Bishop and Delbert Bishop; her husband Herman Crawford; son David Crawford; and daughter-in-law Cindy Crawford. Pallbearers will be Matthew Crawford, Austin Crawford, Michael Crawford, Edward LeBlanc, Jason Carroll and Beau Behrnes; with Alec Carroll, Jeff Stafford and Michael Winfield Jr as honorary pallbearers. Relatives and friends are invited to attend the visitation on Sunday, September 16, 2018 from 2 to 5 PM at the Rabenhorst East Funeral Home, 11000 Florida Blvd in Baton Rouge. There will be visitation on Monday, September 17, from 9 to 10AM and services at 10AM in the chapel. Service officiated by the Reverend David Melville of Francis Ashbury United Methodist Church. Interment will follow at St. John the Baptist Catholic Church Cemetery in Brusly.